Kallie Peurifoy, of Charleston, South Carolina, a senior majoring in environmental science in the College of Agriculture and Life Sciences, interned at the U.S. EPA’s Enforcement Targeting and Data Division in the Office of Enforcement and Compliance Assurance. Photo by Jelena Djakovic. The BP oil spill in the Gulf of Mexico. Human health disparities in Appalachia. The Dan River coal ash spill in North Carolina. The water crisis in Flint, Michigan. Air pollution in urban industrialized areas around the world. Now more than ever, U.S. laws designed to protect and improve public health and the environment, such as the Clean Water Act, the Safe Drinking Water Act, and the Clean Air Act, require federal support and adequate revision. With drought, pollution, rising temperatures, wildfires, increased severity and frequency of storms, invasive species, and emerging diseases, lawmakers need access to the most up-to-date, accurate scientific information to make informed decisions when revising and enforcing public policies. In other words, they need scientists. To address this need, the Global Change Center at Virginia Tech created a summer fellowship program to send undergraduate science and engineering students to the nation’s capital to learn firsthand how science shapes policy. “Science plays a prominent role in the policy deliberation process, but we need young scientists and engineers to pursue careers involving decision-making at all levels of government,” said Bill Hopkins, a professor of fish and wildlife conservation in the College of Natural Resources and Environment and director of the Global Change Center. Now, the center’s goal is to send at least two students to Washington, D.C. next summer, which is why it recently launched a 30-day fundraising campaign that will be matched dollar per dollar by the center. During the program, students will earn six academic credits while spending 11 weeks fully immersed in challenging science policy issues that shape communities locally and nationally within agencies, such as the U.S. Fish and Wildlife Service, U.S. Department of Agriculture, The Nature Conservancy, American Red Cross, USAID, and the U.S. Environmental Protection Agency. “With assets in the National Capital Region, Virginia Tech is uniquely positioned to nurture the important relationship between science and society, so by placing Hokies on the Hill, we can positively influence public policies that will improve quality of life and preserve the environment long into the future,” Hopkins said. The Undergraduate Science Policy Fellowship Program, now in its third year, is designed to expose students to the role scientific knowledge plays in policy decisions on issues from human rights and health to water quality and endangered species. It is also designed to expose future scientists to the realities of policymaking, which is based on societal norms and values, economics, and politics in addition to scientific and technical knowledge. 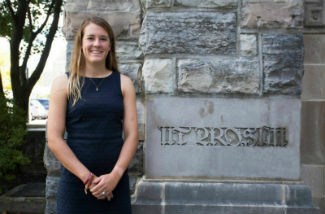 So far, four Virginia Tech students have been awarded fellowships. Kallie Peurifoy of Charleston, South Carolina, and Steven Hall of St. Paul, Virginia, were the two 2017 award recipients. Peurifoy, a senior majoring in environmental science in the College of Agriculture and Life Sciences, interned at the U.S. EPA’s Enforcement Targeting and Data Division in the Office of Enforcement and Compliance Assurance. While there, she was introduced to environmental policies and legal terminology. In turn, she introduced policymakers to the “science side of things,” she said. In the process, she reviewed water facilities that emitted certain contaminants and then located public systems with emissions above permissible legal thresholds. She was then able to inform local government authorities and the public about their water quality. “In Washington, D.C., itself, you’re surrounded by so much government and policy you start to build a connection, a link,” said Steven Hall, a junior majoring in mechanical engineering in the College of Engineering, who said this experience opened his eyes since hailing from a small Appalachian town. “A lot of people feel a disconnect from big government, especially now with politics. But from being there I’ve learned how much of an impact I can make through my career and how I can become a change-agent for society,” said Hall, who interned with the EPA’s Office of Enforcement and Compliance Assurance. Fellowship recipients participate in the science policy track of the Washington Semester program, administered by the School of Public and International Affairs at Virginia Tech. One fellowship ($7,000) fully funds tuition, living expenses, transit, and a stipend. The fundraising campaign will run through Nov. 1. Supporters can send a #Hokie2Washington by donating at the project’s page and spreading the word through Facebook and Twitter. The application deadline for Summer 2018 is Dec. 10, 2017.